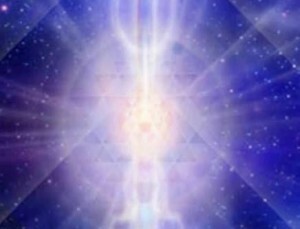 This post is a continuation of Mass Telepathy and the Creation of Reality I. The posts are talks given in the mornings at the Julia Assante Institute in Vienna. From all we know about the making of our reality according to the science of quantum mechanics, it appears that we pluck physical reality out of a stew of waves in undifferentiated states. The waves are not yet anything, just potentials. They are in what is called superposition, which I like to think of as a virtual dimension, a virtual reality in which subatomic entities exist in all their theoretically possible states. Some physicists believe that following an observation at the quantum level, which makes the subatomic wave become a subatomic particle, all the other potentials it has in superposition are also realized. We are aware of only one of them, the collapsed quantum particle. This idea has given rise to the so-called Many Worlds theory or Multiverse theory, a theory I thoroughly subscribe to. That means that every quantum event creates a new universe that then goes on its own path. The number of postulated universes approaches infinity. By intention, we pluck the subatomic particles from their superposition. And by telepathic consensus, telepathic expectation of what we think reality should be, and by our attention, we “collapse” the waves into particles. That means that by intention, waves become particles. This is what the baby learned to do. She learned to convert the wave energy she was seeing into particles, because telepathically that is what was expected. We each do this in slightly different ways. Children who were brought up by wolves, some of which have been well documented in India, create different realities because they telepathically conform to the expectations of the wolf pack they live with. As a result, the senses of sight and smell in wolf-children perceive differently from the way children brought up by humans see and smell. Wolf children can see in the dark, for instance. And they also see in infrared, as do dogs of all kinds. Now each creature will collapse waves into particles in different ways leading to substantially different results. The reality to a fly with its complex optical system and body antennae, will look and feel different from ours. At the same time, each of us creates reality differently within the margins of overall consensus. Scientists and researchers, especially of psi research, have proposed several theories about how telepathy exists and how it functions. Rupert Sheldrake would say that information is transmitted through the morphic resonance of a morphic field. The morphic field is loaded with telepathic information, which any intuitive knows. I have no trouble with Sheldrake’s proposal, but what exactly is morphic resonance? Sheldrake never explains it other than to say that it is the means by which genetic and social information is passed and received to others of its own species and across species. One of Sheldrake’s pet research projects is on the sense of being stared at. That means a person or an animal realizes someone or something our of visual range is staring at them; the staring could even be coming from a TV monitor. A total of 33,357 trials produced an overall success rate of 54.5%. Odds against chance are a staggering 202 octodecillion, that’s 2 x 10 to 59th power. Could morphic resonance work a little like a tuning fork? Certainly, all living creatures, including plants, have a tuning fork aspect to them that responds to other tuning forks whether of the same resonance or not. Speaking of plants, their telepathy has been proved by the use of simple polygraphs. In one, the researcher just thought about lighting a match and burning one of the test plant’s leaves. At that moment, the plant’s polygraph spike nearly jumped off the chart. The researcher had only thought about it and the plant had a huge reaction. Plants also react to signals of other species besides humans. In another test, plants reacted to the death of an organism three doors away. The polygraphs spiked right at the point when tiny brine shrimp hit the boiling water. So, if a plant has it, YOU have it. Our neurons work a bit like antennae, but then so do our fingers, our toes, our skin, and every other part of our bodies. We know this from tests. A revolutionary area of robotics is using electronic implants in people who are severally physically handicapped from nerve damage or brain damage, people who cannot move anything but their faces. The robots are constructed to move things for them. The implants are embedded in specific areas of a person’s brain. When that person thinks, move right, and pick up the cup in front of me on the table, that thought command is somehow sent out through the implants and their tiny antenna as electrical impulses. The implants are directly connected to a computer which picks up the impulses and decodes them, formulating them in computer language. The computer then directs a robotic arm near the disabled person to move right and pick up the cup. At the point, the cup is situated at the disabled person’s mouth. She is then able to drink from it without the help of another. This is done by pure thought and the computer’s electrical decoding of a thought. Although thought does have electrical effects, in itself, it is not electrical. We know this because thought transference can take place in Faraday cages that are built specifically to block electrical waves. There are many explanations for telepathy beside morphic resonance. A less scientific one is the notion of the Akashic Records, an imaginary place in some dimension where all thought, all events, all memories, are stored. You might imagine it as a sort of I Cloud we all have access to. It is astonishing to me that some people claim to be reading the Akashic Records as a profession. That would make them omniscient. But so far I have never encountered one of these professionals who was even remotely omniscient. Scientifically speaking, the Akashic Records idea comes very close to the Zero Point Field, a parallel that some scientists support. What is the Zero Point Field? And is it important to telepathy and the nature of thought? In the quantum world, fields are created by an exchange of energy. Subatomic particles resemble little packets of vibrating waves, passing energy back and forth as if in an endless game of soccer. All elementary particles interact with each other by exchanging energy through what are considered temporary or “virtual” quantum particles. Virtual particles theoretically exist in a virtual dimension, like our I Cloud. Or you could perhaps identify the virtual reality of virtual particles as the realm of antimatter. All subatomic particles have their opposite in antimatter. An electron which carries a negative charge is in antimatter a positron, a quark has an antiquark. Yet they are strongly connected, the one reflecting the other. Virtual particles, or negative energy states, do not take physical form, so we cannot observe them. Even real subatomic particles are nothing more than little knots of energy, and emerge in our world out of nowhere, appearing in our known universe for less than a millionth of a second only to sink back into what we now suppose is an undifferentiated void, like this proposed virtual dimension. This is a crucial point which we will return to again and again. The action of particles causes random fluctuations of energy without any apparent cause. Those back and forth passes, which rise to an extraordinarily large ground state of energy are known collectively as the Zero Point Field. This energy was measured at Cambridge University by Dr Harold Puthoff at zero degrees Kelvin, what is called absolute zero, equal to minus 273 Celsius, which is how the field got its name. Theoretically, at absolute zero, classical physics says all molecular and atomic movement would stop. Instead Puthoff found “a seething cauldron” of energy evidenced in detectable tiny fluctuations. That means that subatomic matter never really comes to rest but moves in and out of this all-pervasive background sea of quantum energy. The energy generated by one of these energy exchanges between particles is about half a photon’s worth. However, put together, physicist Richard Feynman remarked that the energy in a cubic meter of space was enough to boil all the oceans of the world. So, the Zero Point Field is basically a massive energy switch board that serves to stabilize atoms and subatomic elements. And because the field is responsible for gravity, if it should somehow disappear, all matter would collapse in on itself. Since it is the touchstone of all interaction, all energy exchange, it is also the touchstone of the electrical expression of thought. Therefore it has been likened to the Akashic Records by some scientists and consciousness junkies alike. It is important to note that within the Zero Point Field, atoms and their particles are in contact with each other. The Zero Point Field idea also supports the equally interesting notion of the One Mind. Obviously, if we are all fundamentally connected at the mind level, for which there is some evidence, then telepathy would seem to be the natural outcome. But if the One Mind idea is true, then how are those connections of mind made and how are they maintained? The most plausible answer to this is through entanglement, the subject of Part III on how mass telepathy creates the reality we live in.